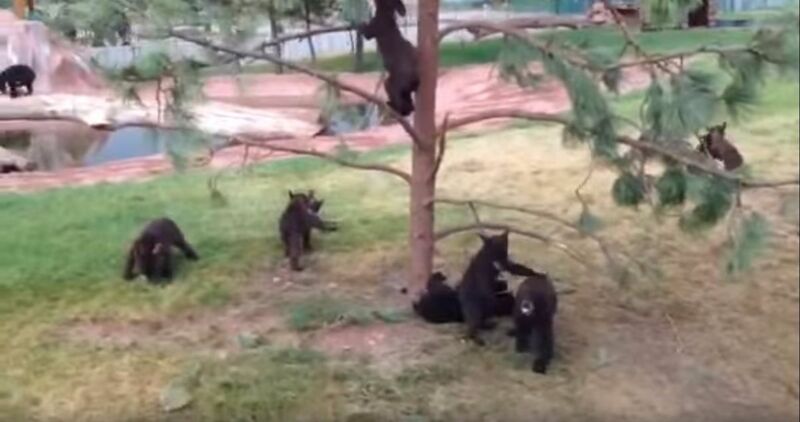 The adorableness is off the charts as a passel of baby bears here play in a tree. Easily a dozen cubs can be seen climbing on branches or wrestling around on the ground beneath the tree as two delighted spectators film the unbelievable scene. 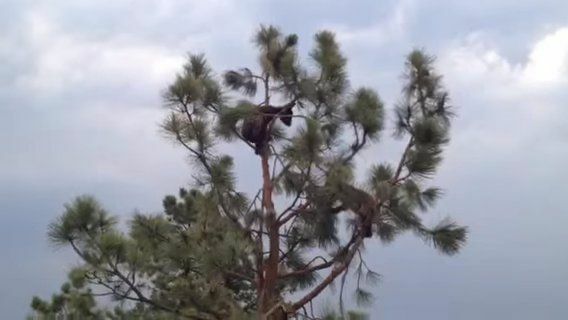 Some of the more adventurous bears make it all the way up to the tree’s top, while other more reticent cubs entertain themselves a little closer to the ground. By the end of the video, the little furry fellows seem all tuckered out and pile in for a nap under the tree! The video was filmed at Bear Country near Rapid City, South Dakota. Bear Country is a 3-mile drive-thru wildlife park featuring wolves, elk, buffalo, and of course, bears. You can watch the playful bear cubs while stretching your legs with a walk through a section known as Babyland. Most people haven’t experienced a full grown black bear looking in their window, nor had the opportunity to see a reindeer or elk up close. However, visitors to Bear Country can enjoy this and more. The park is on nestled on over 200 acres of rolling pines and meadows just south of Rapid City. Bear Country has more than 100 black bears, and visitors love to watch as the bears splash around in the pool, climb trees, and amble around the vehicles, anxious to check out the curious visitors inside. Black bears live primarily in forests in North America’s east and west, swamps, and wooded mountain areas. They’ve been spotted at elevations as high as 7,000 feet. The North American black bear population is estimated at 1 million, with 600,000 of those in the U.S. The name black bear refers to their species rather than color, and they can vary in shades from black to reddish to blonde. Black bears are proficient climbers and are often seen in trees, thanks to their curved claws. Can you count all the bear cubs in this video? SHARE if you can!